Obama File 62 Obama "Understands What Socialism Is", Works With "Socialists With Backgrounds in the Communist Party"
A leading US Marxist claims that president elect Barack Obama has read some of his books and "understands what socialism is." Columbia University professor of African American Studies, Manning Marable, writing in the December Issue of British Trotskyist journal Socialist Review, also alleges that Obama works with socialists "with backgrounds in the Communist Party"
Obama represents a generation of what might be called post-racial black politicians-by which I mean they espouse a politics that minimises matters of race. 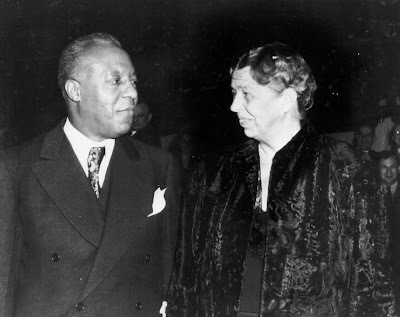 They do not like to talk about race and subsume it under the rubric of poverty and class. So they are generally left of centre, or liberal, on social and economic policy. Obama is a progressive liberal. Manning Marable is certainly in a position to know about Obama's views and reading habits. Whether Dr Marable and Barack Obama have ever met I'm usure, but they have been "close" for many years. Since the 1980s Dr Marable has been a regular speaker at DSA's annual Socialist Scholars Conference, usually at held Cooper Union in New York. In the early 80s, Obama "went to socialist conferences at Cooper Union and African cultural fairs in Brooklyn". Perhaps Dr Marable inspired Obama then, just as Obama inspires Dr Marable today? In the mid 1990s Dr Marable was a key founder of the New Party, which Obama joined in 1995 to help him with his successful Illinois State Senate. Several key New Party people knew Obama personally, including Carl Davidson , Obama's friend and neighbour Quentin Young and long time colleague Congressman Danny K Davis. 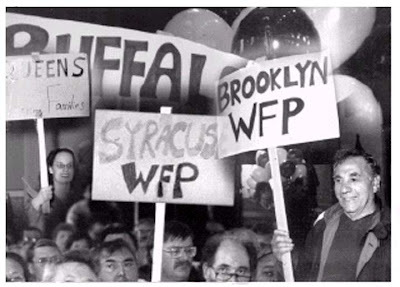 Incidentally, when Dr Marable voted for Barack Obama, he voted for him not as a Democrat, but on the New York Working Families Party (WFP) line. Manning Marable is a member of the WFP which is a direct descendant of the now defunct New Party. "Why vote for Obama on a Working Families ticket? You are counted independently of the Democrats and it shows there is a left constituency in the state of New York. It gives us some leverage on decision-making and policy and we run our own candidates at local level". 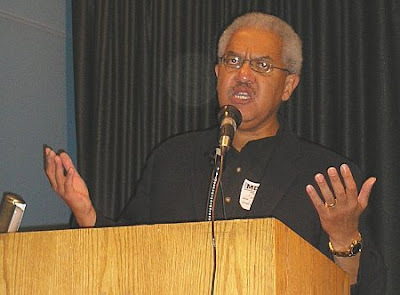 Dr Marable has been for at least 20 years a leading member of Democratic Socialists of America (DSA)and as such would probably know most of the many DSA connected types in Obama's orbit, including Quentin Young, Lou Pardo, Danny K Davis, Jan Schakowsky, Cornel West, David Bonior, Major Owens,the late Rabbi Arnold Wolf, Jackie Grimshaw, William McNary, Jose LaLuz and Hilda Solis. Since 1992 Dr Marable has held leadership roles in the Communist Party offshoot, Committees of Correspondence for Democracy and Socialism (CCDS). As such, he would certainly know well fellow CCDS leaders Carl Davidson and long time Obama friend and supporter Timuel Black. In 1998, Manning Marable helped found the Black Radical Congress (BRC), a coalition of black socialists including many members of the Communist Party, DSA and CCDS. In BRC Marable worked with two DSA leaders, Cornel West, who went on to become half of Obama's 2008 Black Advisory Council and Bill Fletcher jnr, who founded Progressives for Obama with DSA member Barbara Ehrenreich and the ubiquitous Carl Davidson. Obama's long time pastor, the Rev Jeremiah Wright was also involved in BRC. 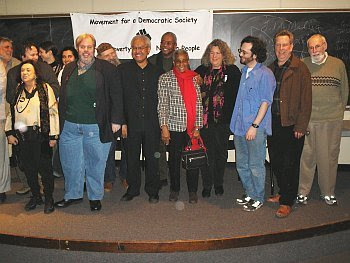 Since January 2007, Manning Marable has been chair of Movement for A Democratic Society, a radical alliance of Communist Party, DSA an CCDS activists and former leaders of the radical Students for a Democratic Society and its terrorist splinter, the Weather Underground Organisation (WUO). In MDS Dr Marable worked with several more Obama friends or colleagues including former WUO terrorists Bill Ayers and Dernardine Dohrn and former SDS leaders Mike Klonsky aaaaaa-a-a-nd CARL DAVIDSON! Dr Marable has also been involved in the radical Washington based think thank Institute for Policy Studies (IPS). through IPS Marable may have gotten to know several other Obama friends, colleagues or supporters, including David Bonior, Congressman John Conyers, Obama mentor Abner Mikva, Bill Fletcher jnr, Barbara Ehrenreich, Quentin Young or even Obama's choice for CIA boss, Leon Panetta. This does not trouble Dr Marable, as a Marxist tactician, he understands that to win elections and promote his policies Obama has to be subtle. He must bring his opponents on board and be careful not to scare centrist voters. Obama regularly sends text messages to millions of people. He just sent a message saying, "Don't go away, now I need you to help govern." There is a debate right now within the Obama campaign about whether to move fast or go more slowly. The argument is that there have been 10 elections for president between 1968 and 2004and Republicans have won seven of them. Obama is looking at the history and so are progressives who worked with him or critically endorsed him, like myself. My argument is simple. The left must force him to carry out the agenda he promised, and that includes a national healthcare system...That is the number-three priority. The main priority is ending the war in Iraq. The second is the economic crisis. We need a robust Keynesian approach to employment and investment in infrastructure - a lot of the bridges built by the works projects administration of Franklin D Roosevelt 75 years ago need to be rebuilt and the roads are crumbling. Dr Marable goes on to explain the role of the left-that is the Communist Party, DSA, CCDS, MDS, Progressives for Obama and the countless unions and "community organisations" under their control. All these key organisations continually push the line that they must create a mass movement to push Obama to the left-just as the communists and socialists did in the 1930s when they forced Roosevelt to adopt their (sometimes justified) policies. Manning Marable is in a far better position than most American voters to know Barack Obama's true thoughts and goals. As a life long Marxist, Dr Marable believes that Obama is on the right track and wants his comrades to show understanding and offer support. Someone has been fooled here. Is it the American voter-or is it Manning Marable? Not bad, now you're finally close to writing an accurate piece. You're still way overblown an the 'countless' unions and community organizations we supposedly control. Out of all of them in the country, I'd say it's less than five cent. Yes, the Working Families Party is what's left of the old New Party. But you left out the reason. Only New York state allows fusion voting, to its credit. In the others, reactionary laws, mainly passed in the 1900-1920 period, wouldn't permit it. It works against the third parties of the right, too. As for the three point program--ending the war in Iraq, finding some Keynesian solutions to the economic crisis, and health care, that's not bad either. There a progressive majority for all that. I'm not sure what health care you have in New Zealand, but we can only dream of having one as decent as your neighbors in Australia. Obama's, unfortunately, to the right of that. Whatever your hopes and expectations are, you can have some fun with the gear at this link. Check out the "Has Barack Let You Down Yet?" range.....Yes, it's starting already! You're still way overblown an the 'countless' unions and community organizations we supposedly control. Out of all of them in the country, I'd say it's less than five cent. Okay, Carl, why don't you tell us exactly which unions and community organizations you admit you control? Carl, I'm more confident in your movement then you seem to be. If by "we" you mean Committees of Correspondence, then maybe you do only control 5%. As you well know Carl those groups lead United for Peace& Justice, AFL-CIO, big influence in Change to Win, Jobs With Justice, USAction etc etc etc. Congratulations Carl, your team is doing well. It's nice to see Carl Disinformationson trolling on another continent for a change. Climate Change Crap On Retreat?